Clear glass vase will be used if blue is not available. 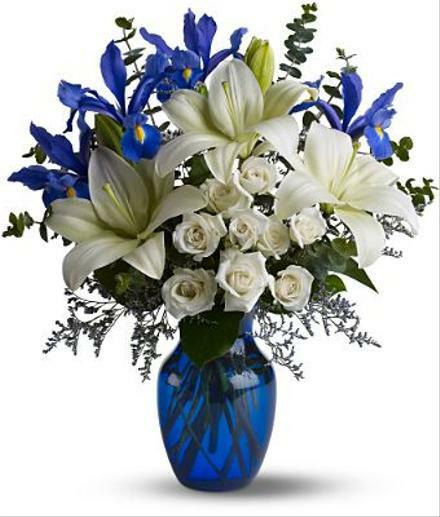 As open and bright as a winter’s sky, this exquisite bouquet of white and blue blossoms such as Asiatic lilies, spray roses or roses and iris makes a stunning gift. An eye-catching selection.. Corportate Gift Ideas - Blue Horizons in Vase. Florist Notes: If the blue vase is not available, the floral designer will use a reguialr clear glass vase. Select a large card and your message will be hand written. Blue iris is not always available. Arrangement Details: Created by hand by the best florist in town and hand delivered too.